This was the Icelandic film entry for best picture in the Oscar foreign film category. It did not make the final cut for nomination. It is written and directed by Grimur Hakornason and stars two experienced Icelandic actors Sigurdur Sigurjonsson and Theodor Juliosson who play two brothers. 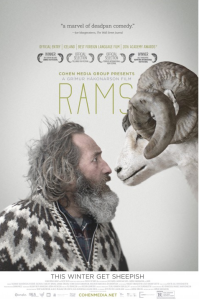 The film is set in the mountains of rural Iceland in a small sheep farming community. This is definitely not a familiar setting for American film goers. What is familiar is that we are presented with a story of a sibling conflict. There are two brothers with adjacent sheep farms who have not spoken to each other in more than 40 years. An outbreak of sheep disease (scrapies) is dramatically discovered which requires the slaughtering of everyone’s sheep in this small community, which would take away their livelihood for at least the next two years. It would also mean the wiping out of the stock of animals that has been in these two brother’s family for many generations. There are lots of moments of drama and tension in this movie. Certainly, the filmmaker, who we met at our screening, knew this setting quite well. He mastered the depiction of man and sheep in the beautiful countryside and the deadly snowstorms that can occur. He injected a subtle sense of humor into the various serious dilemmas, which the characters are facing. Of course, the main theme of this story is the antagonism between these two brothers. As mental health professionals, we know that this universal theme can be one of the most painful conflicts of the human condition and often plays out with many heartbreaking, heartwarming and fascinating variations. By taking on this issue, the filmmaker had the opportunity to provide not only new insights into this universal story, but also to enrich it by highlighting the cultural layers from the Icelandic setting.